There are undercurrents and peripheral taste preferences that are a defining part of our individual and collective cultural experience. Music is no exception. George Plasketes adapts the iconic "e;A-side/B-side"e; dichotomy from the 45 r.p.m. for use as a unique conceptual, critical, historical, and cultural framework for exploring and threading together a variety of popular music and medi… a texts. The profiles and perspectives focus on the peripheries; on texts which might be considered "e;B-sides"e;"e;overlooked, underappreciated, and unsung cases, creators, patterns and productions that have unassumingly, but significantly, marked popular culture, music and media during the past 40 years. 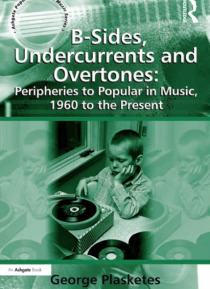 The underappreciated yet enduring contributions of a variety of creative individuals in music, television and film are a centerpiece of this volume: actress Doris Day's son, Terry Melcher, a 1960s music producer whose imprint is on the surf, country blues, garage pop and most importantly the folk rock genre; Hans Fenger's kid chorus cover project, a musical variation of "e;outsider art"e; that became representative of the tribute wave that began in the 1990s and continues today; versatile guitarist virtuoso Ry Cooder's extensive film soundtrack work; World Music "e;missionary efforts"e; of American artists beyond Paul Simon's Graceland, including Neil Diamond's precursor with Tap Root Manuscript in the 1970s and the exotic adventures of Henry Kaiser and David Lindley in Madagascar and Norway"e;to name just a few examples. These B-sides represent undercurrents, but they resonate as overtones in the mainstream of music and culture, many as historical hinges. Collectively, these B-sides are an A-side antidote of outskirt observations, individual snapshots of artists, artifacts and rituals, genres and generations, producers and musical productions in television, film and video. They constitute an important connect-the-dots cultural chronicle with a multi-layered context"e;social, legal, historic, economic, technological, generational, aesthetic"e;for interpreting the interrelations between creators and institutions, the music market place, the production of culture and important connections between the peripheral and the popular.